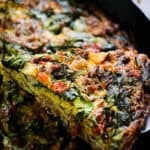 This loaded Whole30 Breakfast Casserole checks all the boxes! 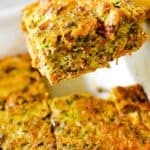 We like to serve it over some greens but it even has veggies baked into the casserole to fit the Whole30 meal template. It’s dense, filling and packed with goodies that will have you coming back for seconds. 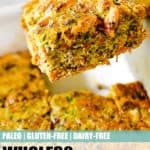 This will be your go-to Whole30 breakfast casserole! When doing a Whole30, it is important to start your day off with a filling breakfast within one hour of waking up. This breakfast should include portions of protein, vegetables and healthy fats. 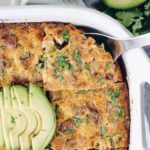 We kept these tenants in mind when we created this delicious loaded Whole30 breakfast casserole. 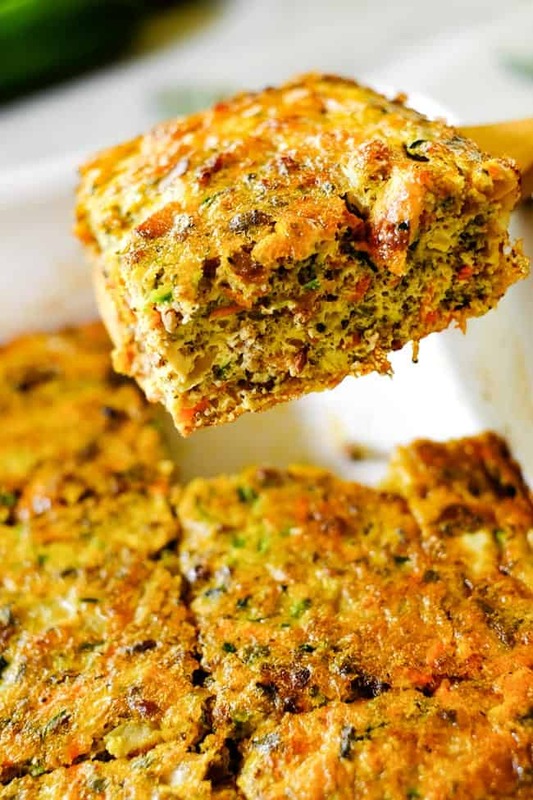 It’s rich and filling with bacon and sausage plus it gets an extra boost of veggies with onion, carrots and zucchini. Don’t knock it until you try it, you will truly love the taste and texture of this filling casserole! 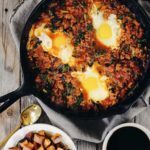 One way to make your Whole30 easier is to prep a large breakfast meal in advance over the weekend so you have breakfast already made each morning – all you have to do is heat it up and eat. 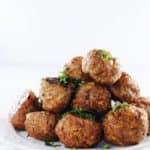 Since you will be cooking all (or nearly) all of your meals at home for your Whole30, you need to utilize all the tricks you can to keep yourself on track. 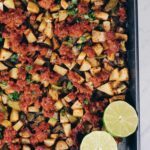 Making this loaded Whole30 breakfast casserole over the weekend will save you from making breakfast from scratch for an entire week! For a lot of people, planning meals, searching around the internet for Whole30 recipes and making shopping lists each week are some of the hardest parts of doing a Whole30. What if we told you that we’ve already done this for you – TWICE!?! Yes, we have put together two complete Whole30 meal plans with recipes and shopping lists for every single meal during your Whole30. 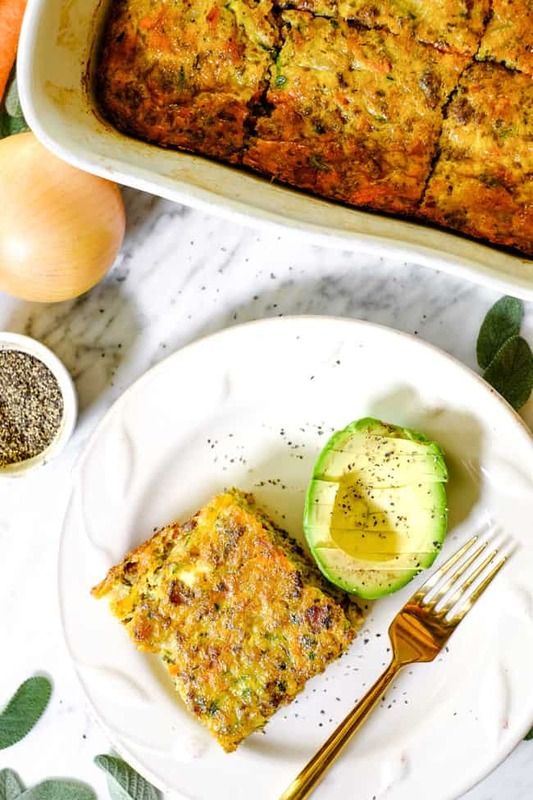 The plans utilize make ahead breakfasts like this loaded Whole30 breakfast casserole and leftovers for lunch to make the best use of your time inside and outside of the kitchen. Why not give one of these Whole30 meal plans a try? 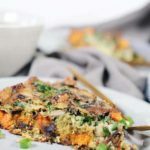 Make your Whole30 easier by whipping up this Whole30 breakfast casserole over the weekend so you have an easy breakfast ready! We know you will enjoy all the goodies and different flavors in each bite. Leave a comment below to let us know it goes. Also, take a pic to share on Instagram! Tag us @realsimplegood, and give us a follow if you don’t already. We’d love to stay connected! This loaded Whole30 Breakfast Casserole checks all the boxes! 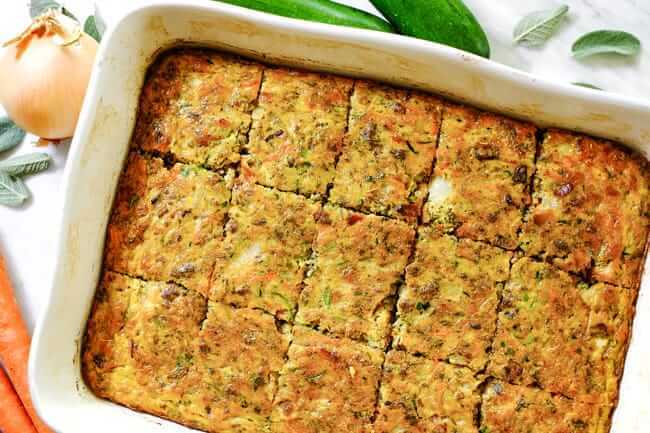 It's rich and filling with bacon and sausage plus it gets an extra boost of veggies with onion, carrots and zucchini. 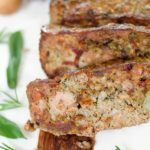 Don't knock it until you try it, you will truly love the taste and texture of this filling casserole! 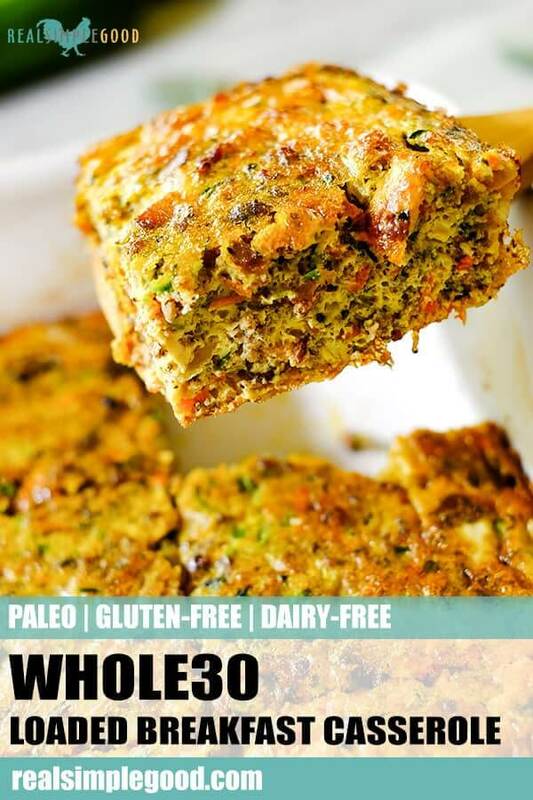 This will be your go-to Whole30 breakfast casserole! Dice bacon and heat a large skillet over medium heat. Once hot add in bacon to cook until it is just starting to get crispy, about 5-6 minutes. Remove and place on a paper towel lined plate, reserving the bacon fat in the pan. While the bacon is cooking, chop onion and garlic as noted. Shred zucchini and carrot in a food processor with the grating attachment or with a hand grater. Once the bacon is done, In the same skillet over medium heat, add ground sausage and onions. Break the sausage into small bits. Cook until the meat is cooked through, about 6-7 minutes. While the sausage is cooking, chop the fresh sage. Once the sausage is done, add carrots and zucchini to the skillet. Cook another 3-4 minutes until softened. Add garlic, Italian seasoning, sage, salt and pepper. Mix well. Add bacon back into the pan and mix again. Remove from heat. Preheat oven to 375° Fahrenheit and grease a large baking dish with butter or ghee. In a mixing bowl, whisk eggs. Add the meat mixture to the eggs and mix. Pour everything into the baking dish. Bake for 30 minutes, or until eggs are set in the middle. Allow to cool for 5-10 minutes, cut into pieces, and serve. 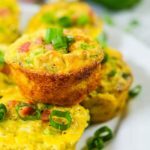 Made this for breakfast this morning and it was a hit! The recipe was so easy to follow. The only change I made was use 1 tbsp sage rather than 2 since I was using dried sage. My husband isn’t a big fan of eggs and thinks most recipes “need more meat” but he went back for seconds and had no complaints! Looking forward to trying more of your recipes, thank you! Hi! 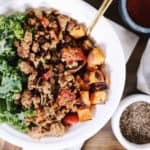 I’m looking into trying Whole 30, I had gastric bypass 2 yrs ago therefore not doing it for weight loss but to help with process of elimination to maintain and improve health, I still need to be mindful of my protein intake, so my question is How much is the serving size that would carry 20g of protein? Thank you! Hi there – we based the nutrition facts on 8 servings. So, if you cut the casserole into 8 pieces, 1 piece would equate to the nutritional serving calculation. Hope this helps.